Come hear the tale of how one video game journalist, driven by the love of the Slurpee, overcame tremendous odds to travel one and a half blocks in two hours. I've never been candid about my love of the Slurpee. I've lived in Georgia since 1984, and back then I used to ride my bike to the local 7-Eleven every day after school for comic books and a delicious frozen treat. A few years later, all the 7-Eleven stores in Georgia went away, and I was eternally sad. Well, perhaps not eternally. Now that I travel the country as a good will ambassador from Kotaku, I get to visit many fine places where the Slurpee still thrives, and I've pledged to get on in every city I visit that contains a working machine. Cities like Boston, for instance. On Saturday night at around 11PM, I entered the elevator in the lobby of the hotel Stephen Totilo and I were staying in for PAX East, holding a pizza that I had purchased from a reputable vendor of cheesy goodness, with all intentions to eat several slices before passing out. As the elevator doors started to close, a couple of extra passengers pushed their way into the elevator. Lo and behold, one was holding a Slurpee brand frozen syrup drink. "Is that...where did you get that?" I asked, unable to believe my eyes. 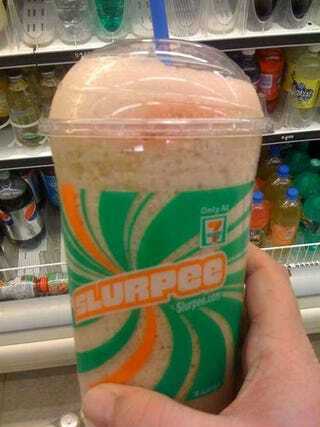 The previous night someone told me there were no 7-Elevens in Boston, and I resigned myself to a Slurpee-less journey. How wonderful to find that information false! "Oh, there's a 7-Eleven on the other side of the library," the stranger explained, speaking about the ancient library across the street from the hotel. I filed this information away for future reference. I had a pizza to eat, and then sleep. No reason to set off on an insane retrieval mission so late at night in an unfamiliar city. An hour later I was setting off on an insane midnight retrieval mission in an unfamiliar city. My plan was simple. I would walk to the other side of the library, a distance of a block or so, and look for the familiar reddish-orange and green glow of a 7-Eleven sign. People familiar with this area are probably already chuckling. The only problem was there is no familiar glow. Okay, that wasn't the only problem. The second problem was it close to freezing outside, and the cold temperature made my eyes so blurry I could barely read street signs. I walked completely around the library without finding my prize. 'I suppose there could be more creative definitions of just behind the library,' I thought to myself. I decided to consult my iPhone. Sure enough, there was a 7-Eleven in my area, but for some reason it could not plot a course to the store. How odd. As I stumbled about, I queried folks I passed on the street, none of which had seen the store in question. Time for the phone a friend option. I called my girlfriend for help. Mind you, she was safe at home in Atlanta, while I was stumbling blindly up and down Boylston Street. She hopped on Google Maps, and confirmed that there was indeed a 7-Eleven in my area, and then began to rattle off street names until I found one that sounded familiar. Dartmouth Street - the road that passed right in front of my hotel and the library the stranger spoke of earlier. A road I confused for Boylston. The address was 300-something Dartmouth. I was at 800-something Boylston. I walked several blocks up and down the wrong street, before coming to the conclusion that something was terribly wrong. Legs aching, eyes blurry, I made my way back to the library. My girlfriend's laptop power died. It was now 1:45am, and I had been walking for nearly two hours. That's great exercise, but disappointment didn't taste nearly as good as a Slurpee. I decided I was going to just stop at the 24-hour CVS, pick up a tea or something, and head back to the hotel, where Totilo was sleeping peacefully, dreaming his Totilo dreams. And that's when I realized I had juxtaposed Boylston Street and Dartmouth Street in my head. I was sitting at the corner of Dartmouth and Boylston. I hopped to my feet, crossed the street diagonally, which was probably dangerous, took about five steps down the sidewalk, and there it was - a tiny, un-glowing sign that read 7-Eleven. If I had to guess, I'd say that Boston, being a quaint, historic little town, felt big glowing signs were garish or something. I spoke to countless people walking in the area during my two hour trip, and not one had seen the storefront. Perhaps their eyes had frozen as well. I think I might have whooped, or at least acting in the overly excited manner that 7-Eleven clerks around the country have learned to fear and mistrust, but I soon had my frozen prize. And for those of you wondering how this is all video game related, BAM. Behold Kratos, in all his blackberry lime glory! I mixed cola, cherry, vengeful god slayer, and Mountain Dew, and head off into the night, sipping a frozen drink in 33 degree weather. I had walked for nearly two hours, but I had my prize. Into a night filled with promise and wonder I walked. Within three minutes I was back in the lobby of the hotel. I sat in the lower lobby, sucking noisily on icy goodness, until the last drops disappeared. I then made my way up to the hotel room, quietly slipped inside, settled into a chair, and fell peacefully to sleep. I stopped by the 7-Eleven twice more the next day, but neither Slurpee tasted quite as sweet as the one I went completely stupid for.